The shortlist for the South African Player of the Year award has been announced with fans set to decide the winner of the prestigious prize. Western Province trio Gio Aplon, Schalk Burger and Juan de Jongh and Blue Bulls duo Francois Hougaard and Gurthrö Steenkamp will go head-to-head for the honour in a public vote after topping a media poll. 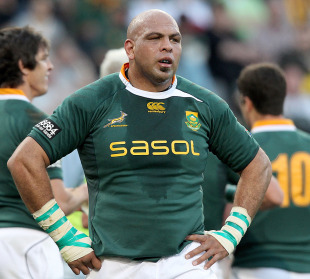 It is the first time Steenkamp has been nominated for the award and should he win he would become only the second prop to win the award after Os du Randt in 1997. Burger is nominated for the second time - having won the title in his first full season in 2004 - while Aplon is also a newcomer to the shortlist after a stand-out season in which he made his Springbok debut. Meanwhile, De Jongh and Hougaard have multiple nominations with the two rising stars also up for the Young Player of the Year award alongside the Sharks' Patrick Lambie and the Griquas Bjorn Basson. Basson, who made his Springbok debut against Wales earlier this year, starred during this year's Currie Cup during which he scored 21 tries to break the record (19) previously held by former Western Province wing Carel du Plessis and former Leopards wing Colin Lloyd - a feat that also sees him nominated for the Currie Cup Player of the Year. The Bulls, who claimed their third Super Rugby title this year, along with the Stormers, who competed in their first Super 14 final, and Currie Cup semi-finalists Western Province and The Sharks are nominees in the category of Team of the Year. The SWD Eagles who will host Friday's Currie Cup First Division final against the EP Kings, are also a nominee in this category. Coaches Allister Coetzee (Stormers and Vodacom WP) and Frans Ludeke (Blue Bulls and Bulls) have been rewarded for their remarkable achievements with their respective sides during the Super 14 and the Currie Cup with nominations for the Coach of the Year Award. Johann Lerm, who guided the SWD Eagles to the final of the Currie Cup First Division, has also been nominated in this category. Nominations for the Super 14 Player of the Year include players who competed in this year's final. The victorious Bulls are represented by scrum-half Fourie du Preez, fly-half Morne Steyn and winger Gerhard van den Heever. The Stormers lock Andries Bekker and centre Jaque Fourie are the other contenders in this category. The awards will be announced on November 1.